Ask anyone who’d been to Iloilo what the best thing to do in the province and you’d get one word for an answer: EAT! Everyone agrees that a visit to Iloilo is a gastronomic adventure that makes one crave for another trip the moment he leaves. Perhaps it’s the innate creativity of the Ilonggos (that’s what locals are called) or maybe it’s the availability of the freshest ingredients that make the food in Iloilo unforgettable. Let us take you through the city and its outlying towns to find what to eat in Iloilo. Rain or no rain, this noodle dish is something to try the moment you arrive. It may arguably be the most popular Ilonggo delicacy. 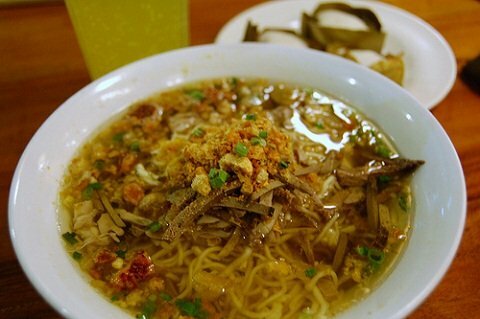 Ask anyone what to eat in Iloilo and you’ll be pointed to the closest batchoyan. There has been a lot of debate as to where the dish has originated but its roots can be traced to the town of La Paz, hence the name. There are as many restaurants serving this dish as there are families claiming to have the original recipe so you can never go wrong when looking for a bowl to satisfy your curiosity. La Paz Batchoy or simply batchoy is primarily made of miki noodles, pork innards, shrimp broth, beef, and crushed chicharon (pork cracklings). Where to find it: As mentioned, there are a lot of restaurants serving their own versions of batchoy but majority would agree that the most authentic can be found in the La Paz Public Market. This is where you can find most of the “pioneers” which started around the 1930s. Netong’s, Deco’s, Teds’s, etc. can be found in this neighborhood. We’re starting to believe that Ilonggos are fond of naming their dishes after the town they were created so here’s another dish under that category. Pancit molo is not your ordinary pancit made of sautéed noodles. Instead, it is a version of the popular Chinese wanton soup. This dish may just really be of Chinese origin since the district of Molo was considered a Chinatown during the Spanish era. Ground meat (often pork) wrapped in molo wrappers is cooked in broth along with chicken strips, minced spring onions and lots and lots of perfectly fried garlic. 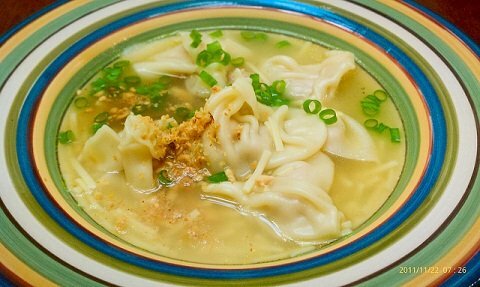 Where to find it: Just like the batchoy, it wouldn’t be so hard to look for excellent pancit molo since it is named after a district in Iloilo City. One place that’s easy to find is Tita Paz House of Pancit Molo, right beside the Molo County Bakeshop. You’ll pass by the building on the way to Miag-ao Church so it’s not hard to miss. Another excellent place is the Camiña Balay nga Bato in Arevalo where you can find Kapitan Ising’s Pancit Molo. This one is both a favorite pasalubong (take home treat) and must-try while in Iloilo. Biscocho is bread twice baked and topped with butter and sugar or garlic. They’re much like your regular breakfast toast, only they’re so much better. Biscocho is perfect with coffee or sikwate (hot chocolate) but they’re not bad when consumed on its own as well. Where to find it: There are a good number of bakeries in Iloilo where you can buy these goodies. The Biscocho House in Jaro, Panaderia de Molo in Molo, Deco’s Pasalubong Shop, JD Bakeshop, Trappist Monastery Food Products and Angelina Bakeshop are just some of them. 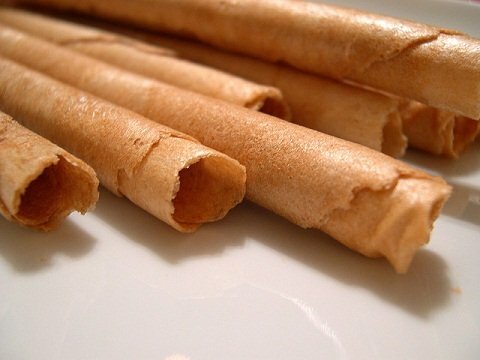 We all know that barquillos and ube-flavored ice cream go well together but did you know that these cylindrical wafers come from Iloilo? I distinctly remember how I consumed these as a child. I put a finger through the cylinder and eat away until only a “ring” is left. Fun huh? It’s more fun when the barquillos come from Iloilo, trust me. Sometimes, the hole is filled with polvoron (a mixture of flour, milk, pinipig and crushed nuts) to make another delicacy, the barqueron (barquillos-polvoron). Where to find it: You can find them pretty much anywhere baked goods are sold. To be safe, you can head to the nearest pasalubong center where you can find plenty of choices from the famous makers of this delicacy. Out of all the delicacies in this post, this is my personal favorite. I can finish a whole pack (maybe even two) of pinasugbo in one go. This treat is made of thinly sliced banana, caramelized with brown sugar and topped with sesame seeds. They’re packed ice-cream style, with a small sheet of paper serving as the cone. It is chewy, sweet and the sesame seeds give it a distinct taste and texture; it’s simply perfect for long road trips to any other part of Panay Island. Where to find it: Just like the biscocho and barquillos, pinasugbo can be found in most pasalubong centers. If you cannot make the trip to Iloilo, you can find these in supermarkets all over the Visayas. With so many delicacies in this region, the question is not really what to eat in Iloilo but what to eat first. If you’re visiting Iloilo, you’d soon find yourself embarking on a delightful discovery of local cuisine that has been perfected through time. And that, friends, is where the charm of the Ilonggo cooking lies.